It might help others to identify the shrimp, if they know where you are from. 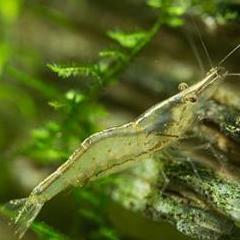 It looks very similar to Caridina serratirostris, known in the aquarium trade as ninja shrimp. We have a species in Australia called the 'chameleon shrimp', because it can change colours quickly, and disappear. They are relatively small at 2-3cm. I'm from a small, tropical island in the Indian Ocean. One of the many Seychelles Islands. The thing is though... I've watched them before and they don't have quick or sudden colour changes which I'm guessing is some form of requirement for them. Chameleon shrimp don't always tend to have a quick colour change, it really depends on how stressed they are to how quickly they drop or change their colour. Otherwise if they are relatively settled and happy in their environment their colour changing I have found tends to be more gradual, if at all with many individuals seeming to settle on one colour or pattern and sticking to it because they tend to always hang out in one particular area of the tank. In Australia we also have glass shrimp which are considered wide spread up and down the Eastern coast , but not a huge lot of study has been done into the full genetic make up of all the shrimp considered to be glass shrimp. Australian glass shrimp ( Paratya australiensis ) can have a lot of colour and pattern variation when first caught but quickly drop these colours and patterns once kept for even a few minutes even if still in the original water they where caught in. Once they drop their colour and are put in a fish tank I have found they ever regain the colours or patterns. I have found dark bluey browns, glossy blacks, black or brown with solid stripe down the back and even ones with faint yellowish or greenish colour. If you can try to get some clear close up photos of the head/ rostrum area as it is often the shape of this rather than just colour that helps determine a species. One of the other give aways is the chunkiness of the body and the actual body shape. With some shrimp species having a very distinct peak about mid way along their back while other species tend to just have a gentle curve down to the tail. I'll see if I can drag up some of my old photos of Australian Chameleon shrimp and wild caught glass shrimp for you. I've also noticed they have slight bumps or spikes on their beaks. Do all species have this? 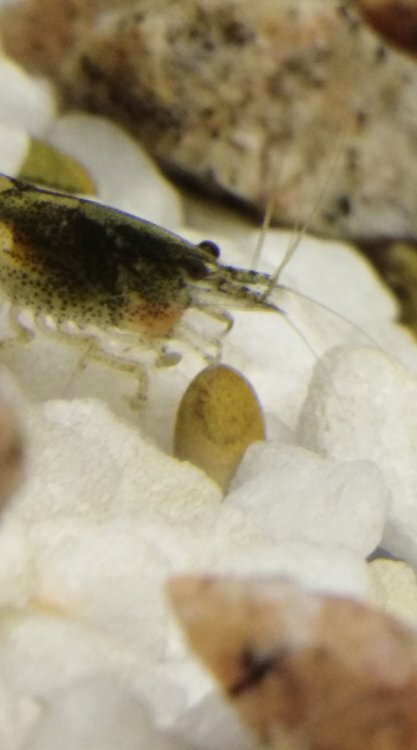 I believe they are also low order as I have two berries shrimp and their eggs are smaller than their eyes. Chameleon shrimp don't always tend to have a quick colour change, it really depends on how stressed they are to how quickly they rop or change their colour. Otherwise if they are relatively settled and happy in their environment their colour changing I have found tends to be more gradual, if at all with many individuals seeming to settle on one colour or pattern and sticking to it because they tend to always hang out in one particular area of the tank. I believe it is the amount of spikes/ bumps (or lack of) on the beak as well the spacing that helps to visually distinguish shrimp species when the shrimp are other wise quite similar in size and at a glance appearance. These were sold to me as being Sunkist Shrimp. I'm totally new to the hobby and forgot to verify the scientific name. I called the store back a few days later and was told by a different employee they are Caridina Cantonensis. Does that seem correct based on the photo? I'd sure like to verify so that I can learn more about their requirements.